You’d probably be excused for confusing Louie’s Lunch with Louis’ Lunch, the venerable Connecticut restaurant which claims to be the birthplace of the hamburger. Both have Ivy League links (Louis’ Lunch is in New Haven, home of Yale, while Louie’s Lunch sits on the north campus of Cornell in Ithaca, NY), both are mobile (Louis’s moved four times before settling into its current location and Louie’s has four wheels and thus can move at any moment – though there are a bunch of wires to unhook from the light pole and something that looks curiously like coax cable) and oh yeah, both serve darn nice, lo-fi burgers. With lineage dating back to 1918, the current Louie’s Lunch truck sets up shop seven days a week to satiate the late night cravings of our country’s future doctors, lawyers, jock-rockers (Huey Lewis) and surgeon generals (oh yeah I’m talking about you C. Everett Koop). Until 3 am (except Sunday nights when they retire at the modest hour of midnight) students in various states of stress and/or inebriation can hit up this mobile c-store for cold drinks, hot coffee, energy shots, candy bars and of course – burgers. Back in college at the much less educationally challenging (though no less hilly) Mansfield University, I discovered the Bo Burger, a griddled hamburger topped with cheese and a fried egg. To this day, no single dish has screamed “college” to me as much as this combination which I used to enjoy at the local truck stop affectionately known as Greasy Eddie’s, and so when I saw the Bo Burger listing on the starboard side menu of the truck I jumped at the chance to reminisce about my own college years. Louie’s version featured about 1/4 lb of griddled beef, resting on some white American cheese and topped with a nicely cooked egg. Health departments be damned for their insistence that eggs cannot be runny, but kudos to the flat-top chef who brought this oeuf in just on the cooked through side, avoiding that rubbery, overcooked state. The Bo Burgers of my youth were served on squishy white buns, but this being Ithaca (home of Moosewood and macrobiotic jerky) my Bo was served on a whole grain bun flecked with oats…a bit odd, but good; almost allowing me to dream for a second that this burger was kissed by Mother Earth herself and thus filled with only healthful vitamins and minerals (reality check – it is in actuality a glorious greasebomb of a burger!). Served with a smile by an actual Cornell student, I give this burger high marks for both quality and history. 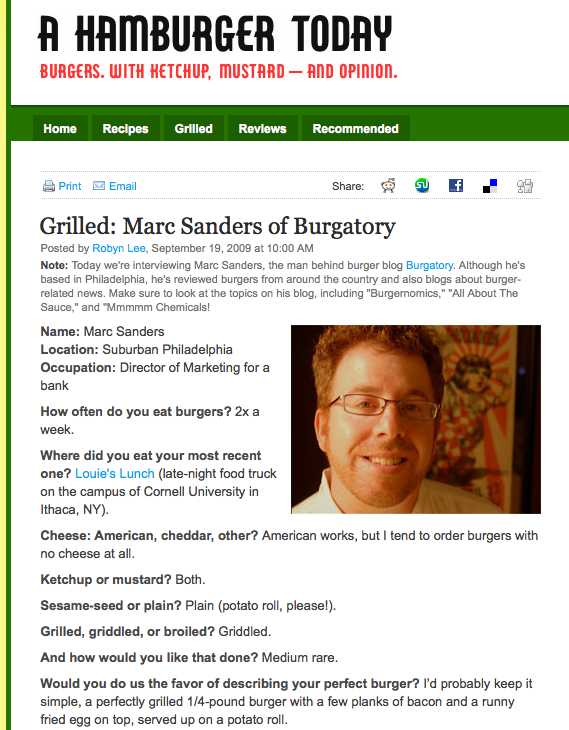 For years I have been fascinated by the idea of making decent burgers in a food truck and as mentioned on this site before, my own bucket list includes opening a mobile burger shop called “Burgatory” (ideally parked on City Ave in Philadelphia half-way between the Catholic Seminary and the Hebrew Yeshiva). Louie’s provides further proof that good burgers can come from just about anywhere and thousands of Cornell grads no doubt have fond memories of placing their own late-night orders at Louie’s window. The Louie’s folks have done a great job of cataloging their own history on their web site. For more details on the various iterations of the lunch truck and pictures of through the years, click here. This is the first of a four part series ingeniously titled “Burgers I Ate While In The Finger Lakes Region A Few Weeks Ago.” Future installments will include entries from a winery, a creamery and the epicenter of the gourmet vegetarian movement. Stay tuned. That looks really good. I always loved more of the home-y goodness that comes from grease trucks. It’s basically impossible to find two trucks that taste the same. Variety baby!! Louie’s Lunch is great, and I realize we’re talkin burgers here, but I hope you didn’t miss The Hot Truck on West Campus Cornell while you were there. The Hot Truck was actually closed the night I went…would have definitely hit there as well. Next trip. Thanks for commenting. Think Louie’s Lunch truck would make a trip to Tulsa? After it hits Philly! Really digging your site, can’t wait to hear more about burgers in your neck of the woods. Thanks for the link from your site. Your Grilled on AHT was great. The bo-burger originated at Obie’s Diner on the far west side of Ithaca (near the railroad tracks). The classic bo-burger is served on a sesame seed bun. Thanks Steve. So I’m guessing Obie’s Diner is no more? Been reading posts from all over the net about the truck. I worked on the truck in the late 60’s – early 70’s when we were on Stewart Ave…across the street from Johnny’s Hot Truck. When we moved to the present location on Thurston, we thought we were in heaven. Real electricity. No more propane. The truck pictured on most sites now is the truck Eddie and my Son built. It is actually the 3rd version of the one Eddie got from his dad, Cookie Machen. And…it was Eddie who started serving the “Bo-Burger” back in the late 60’s. The one true tragedy is that when Eddie passed away…he took his recipe for Bar-B-Q sauce with him. Bottom Line….THERE IS NO COMPARISON TO TODAYS LOUIES LUNCH, AND LOUIES CIRCA 1960’S. PERIOD. Thanks for finding the site and posting your comments, Wayne. Can you tell me anything about the origination of the Bo Burger? In my mind it is an upstate NY creation. Not sure where it originated, but still my favorite way to eat a burger. Obie’s diner, two rail cars, created the Bo Burger. It was a hamburger topped with fried onions, an egg, and a slice of cheese. I always had one with chili and, of course, Obie’s famous apple turnover as the dessert. Great meal at 2AM. The first time I went there I thought the chili wasn’t spicy enough. I asked Obie for some Tabasco sauce. He found that so surprising that he always gave me chili free. Cornellian’s should know that Bo Roberson, widely regarded as one of the finest athletes of all time and certainly one of the finest athletes in Ivy League history, was a graduate of Cornell. That’s where the name comes from. Thanks for finding the blog and for your comments, Mike. Cool stuff.